Did you know that your body stores stress? Everyone reacts differently to stress. For many of us, mental stress manifests into physical symptoms such as a stiff neck, temporomandibular joint (TMJ) pain, tension headaches, and even shortness of breath. There are tension-taming techniques that can ease the effects of stress on the body. Get into your head. If you squint at your screen all day or grind your teeth to a pulp each night, you likely experience a lot of aches and pains in your head. By practicing this muscle-calming circuit, you will quickly feel relief from such common ailments as tension headaches. Take a deep breath and hold. Squeeze your eyes shut and furrow your brow. Hold this contraction for five seconds, paying close attention to the sensation of pressure in the muscles surrounding your eyes and forehead. Exhale slowly, releasing the tension from your eyes. Repeat five times. Now take another deep breath and clench your jaw tightly. Notice the pressure around your teeth, neck and jawline. Exhale and release your bite. Repeat five times. A pain in the neck. Your neck spends a lot of time in unnatural, fixed positions such as bent down for hours while reading or craned forward while staring at your computer. By implementing neck stretches into your routine, you can relieve and release the strain that builds in this sensitive area over time. Breathe in, and with your spine straight slowly tilt your head back as far as you comfortably can. Hold for five counts then exhale, returning your head to a neutral position. Repeat five times. Place your right hand on your left shoulder, applying light pressure. Inhale and gently tilt your head down so the right ear moves toward the right shoulder. Hold for five seconds, then exhale and return to the starting stance. Perform five repetitions on each side. Inhale, filling your lungs and elongating your spine, and exhale fully. Breathe in once more, but now roll your shoulders up toward your ears and then pull them back, squeezing your shoulder blades together. Practice this five times. Gently lift your arms in front of your body until they are about shoulder height. Keep your elbows soft. Take another deep breath as you open your arms wide enough to feel a deep stretch in your chest, ribs and inner arms. 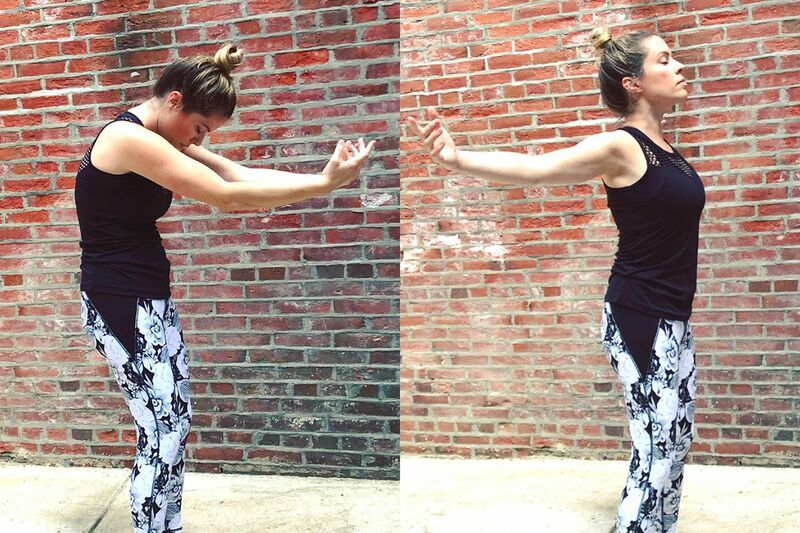 Hold for two counts then exhale, bringing your arms back in toward each other. Allow your shoulders and upper back to curve inward. Repeat five times. Belly aching. Many people suffer from a nervous stomach. When you carry stress in your stomach, the bowels increase their production of acid. This can cause gastroesophageal reflux disease (GERD), which can lead to more serious conditions such as ulcers and even changes in the lining of the esophagus. The easiest way to relax your gut is through, you guessed it, breathing. Take a long, deep breath. But instead of filling up your chest, which most of us so often do, fill your belly instead. Chest breathing can result in shortness of breath, hyperventilation and dizziness. While belly breathing is most effective for relaxation and stress-relief. Hold this breath for five counts then forcefully exhale through your mouth. As you exhale you should feel your ribs and stomach shrink. Repeat this breathing sequence 10 times. You have no control over external stressors, only your reaction to them.